The Secrets of The Perfect House Cat... Exposed! a Perfectly Behaved, Healthy, and Happy Cat! Its no surprise to find out that bringing home a new cat is almost like brining home a new baby into the house. Thats because they are really almost the same thing. Sure, cats have instincts (what living creature doesnt...) but when their paws first touch your floor they are in a new world. Everything seems like a playground to them. Your christmas decorations are now chew toys. Your family portrait is a new sliding surface, and your furniture are scratching posts. It may seem daunting, even intimidating to own a new kitten, but as a cat owner for several years I can tell you that having a loving companion that you can always come home to is always worth it. Cats are more than just pets. They are our friends. The warmth that they bring us on a day to day basis, the unconditional love that they greet us with each morning, all of these qualities make it worthwhile to take care of a a new cat. Sounds Nice - But How? A common joke by cat experts is you can never train a cat, they just train you. And thats more true than we probably think. Take a second and really think about it. You see a cat is behaving nicely, and you think wow, they did a good job raising this cat but you are thinking in human eyes. A cat trains us by having us feed it and clean its litter box daily. It cries, and we answer. Sure, doing these things may be enjoyable for you, but in essence, are you training the cat or is the cat training you? Okay okay, enough philosophical mumble-jumble. Cats can be trained. Its true that cats are very self-reliant creatures, and you may notice that they tend to themselves, but unless you want your cat to run your house theyre are effective training methods that exist that will help you and your cat both understand each other. Better! Most people go about training their cats a wrong way. So wrong in fact, that many methods that owners think work for their cat is actually making their relationship with their cats worse. You can have an unbreakable bond with your cat, but you have to learn how to see the world through their eyes. For example, cats dont learn by scolding them. Every time you scold or yell at your cat when they throw up on your rug, or make in the wrong place, you may think youve won when your cat runs scattering away, but really, you are just scaring them, and confusing them. Quick Tip: Cats learn by rewards. You cant punish a cat for bad behavior, but you can reward a cat with good behavior in order to encourage it to repeat a desired action. The great thing about raising a kitten is that you are forming a bond with a cat at the earliest stage of its life. That means if you get it right, you and your cat will have an iron-clad bond that wont be broken for anything. But if you get it wrong, the reverse is also true. Dont leave your relationship with your cat up to chance, you can understand your new kitten and raise it the way you want to! All my years of owning and watching over cats I learned what cats respond to, and what they hate. Our cats let us know everything we need to know about them, we just need to look for the signs. Body language, eyes, temperament, etc all tell us what we need to know to better bond with our cat. 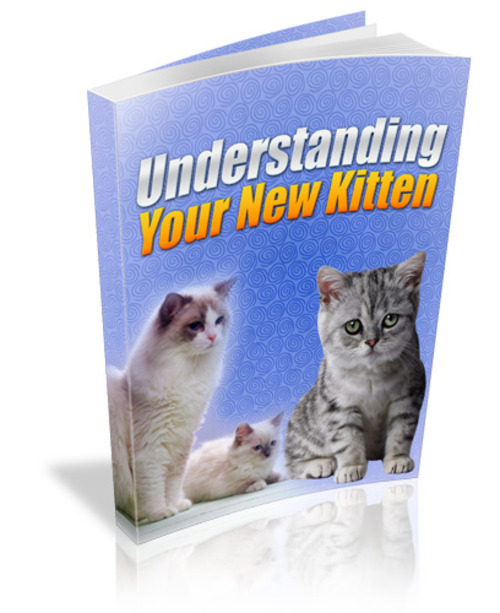 My eBook will tell you all you need to know to raise your own kitten into a healthy, behaved cat. Choosing The Right Cat For You - A Quick Look at The Different Type of Cats and If They Suit Your Personality. Potty Training Techniques - Never have your cat poop in the wrong place again! Cat 911 - What to do if your cat is ever sick or ill.
Get Inside The Mind of Your Cat - With our observational cheat-sheets. Learn exactly what your cat is thinking now. How To Get Your Cat To Stop Clawing & Scratching Your Furniture, Carpets, Decorations, and more! The Best Way To Introduce Your New Kitten in a home with existing pets... or even worse kids! Home remedies for common ailments like fur balls.